A wind turbine near a top-security prison is being switched off in the early mornings because the flickering shadows it creates annoy inmates. The £1m turbine next to Whitemoor Prison near March, Cambridgeshire, produces electricity for 4,000 homes. But Longhill Energy has agreed to halt the turbine because of possible "security problems" if prisoners became upset over the flickering shadows. The firm says the flicker only happens at certain times of the year. Managing director Martin Adler said: "At this time of the year the sun hits the blades of the turbine at a certain angle and creates flickering shadows over parts of the prison. "We've discussed the problem with the prison authorities and agreed to turn the turbine off for a few hours in the early morning." He said eventually new technology would stop the turbine automatically when the sun was at a problem angle. 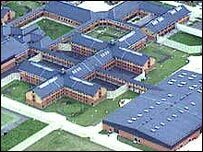 A Home Office spokeswoman said: "We can confirm that HMP Whitemoor is in discussions with the turbine company over the operation of their wind turbine. "The Prison Service is reaching an agreement whereby the wind turbine does not interfere with the smooth running of the prison." The turbine was switched on five months ago.